On September 01, Paramjit Singh Sarna, President, Delhi Sikh Gurdwara Management Committee and former President, Delhi Akali Dal, inaugurated a 16-acre Khalsa School at Surrey (Vancouver) in Canada. On Sep. 06, Sarna addressed NRI community leaders and business men at India's Oven restaurant, Fresno, California. A few NRI Sikhs collectively told Sarna that young members of the community are giving up the most visible religious symbol of Sikh identity - long hair and the turban – in Punjab and as also in other parts of India. This trend has been growing during the last 10-15 years. The drug abuse and liquor consumption in Punjab has reached unprecedented levels. One estimate claims that sixty per cent of the youth are drug users. 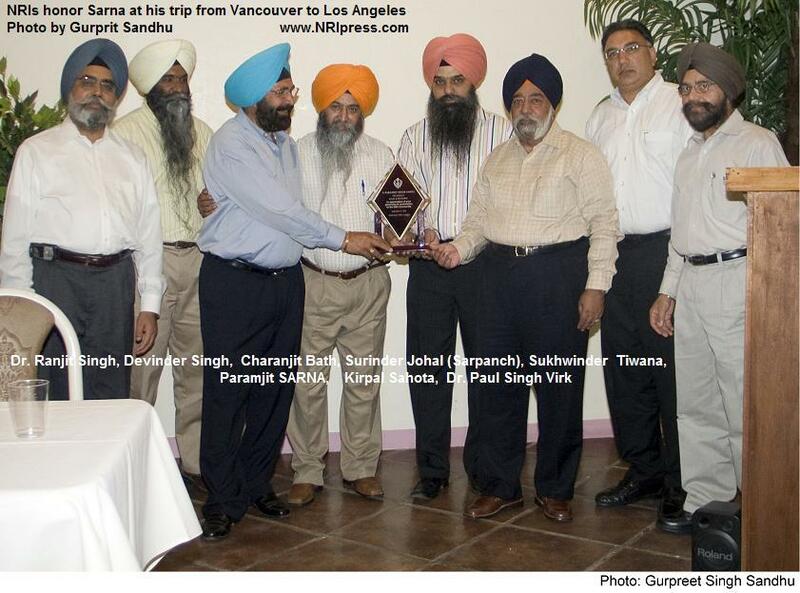 On Sep. 07, Mr. Sarna was honored by a NRI community at Mr. Gurdip Singh Malik’s home, LAcanada (Los Angeles) . More than 100 people participated in the reception including Dr. A.S. Marwah, Dr. H Sahota, Dr. Gurnam Singh Pannu, Dr. Jasbir Mann, Dr. M. Hayreh, Dr. Hakam Singh and Parladh Singh. Interestingly, questions by these individuals were: how to promote Sikhism, how to educate our future generation and hot topic was formation of SGPC in Haryana, and Delhi Sikh Gurdwara Management Committee. Jathedar should not be employee of SGPC or any such committee. Jathedar (high priest) of Akal Takht, the highest temporal seat of Sikhs in Amritsar is an employee of Shiromani Gurdawara Parbhandak Committee (SGPC) which is controlled by the ruling Akali Party in Punjab. The treatment of former Akal Takhat Jathedar has once again strengthened the belief that politics and religion are integral part for Shiromani Akali Dal (SAD) even in pure religious issues. The Shiromani Akali Dal would appoint or fire Jathedar at the whims of the Akali Dal president even though it may amount to insulting the institution of high priest of Akal Takht. It is irony that political bosses of SAD have thrown all traditions of appointing Jathedar of Akal Takht to the wind. The political agenda of the Akali Dal politicians has been ruining the age old tradition of Sikh faith. If any RSS or BJP leader comes to Harminder Sahib for darshan, they are honored by Saropas because they are partner with Akali Dal. Last time when Cap. Arminder Singh ex-Chief Minister, a great respected Sikh leader went there, no saropa was provided. I can only say that, Badal Sahib made great success by making thousands acres land and hotels from his 200 acres land. Mr. Sarna said Delhi Parbandhak Committee never collected funds but we have so many Sikh parwars who donate millions of rupee for good causes. If any poor lady comes to our office to fight a case and needs lawyer's fees, our committee always helps her. We helped more than 1200 widows of 1984 Sikh Massacre by giving monthly pensions. We also are running schools, colleges, job training institutes, nursing schools, accommodations (sarans) and hospitals. We are also constructing Guru Teg Bahadur Memorial where school and hostel will be established for NRI children. We are establishing this project with 200 acre land. We are in the process of establishing Sikh University. He said Sant Babas and political leaders from Punjab come to foreign countries to collect money for some projects and NRIs donate lot of money to them. Did you ever ask them where had they spent this money? The Shiromani Akali Dal (SAD) has sought the Prime Minister's intervention to stop Haryana from granting approval to such a body. It feels such a body would create unrest among Sikhs who may see it as interference in their religious affairs by the Congress and the Haryana government. If Delhi Sikhs can have a separate body, why can’t Haryana? The SGPC could do nothing when a separate body was created in Pakistan to manage the religious affairs of Sikhs there. "If the Sikhs Haryana want to form separate SGPC on the pattern of DSGMC in New Delhi, don't you think that they have democratic right for the same", he quipped? Dr. Balbir Singh said that the NRI Sikh community in North American is very upset about the way Shiromani Gurdawara Parbhandak Committee (SGPC) appoints and fires Jathedar of Akal Takht. The recent unceremonial exit of Jathedar Vedanti and installation of replacement Giani Gurbachan Singh, a repetition of past instances in the recent Sikh history, speaks very poorly of SGPC. Vedanti was brought in the same fashion after removing Giani Puran Singh who was installed after removing Bhai Ranjit Singh. The reports said that Punjab Chief Minister Parkash Singh Badal had told Vedanti to quit else he shall be expelled. Vedanti has told media that he was forced to quit and his resignation was obtained by two loyalists of Badal who came to his residence with no other option but to resign. An other scholar, Dr. Sampuran Singh said, Sikhs institutions are divided over the manner in which Jathedar of highest temporal seat are appointed. However things may not change as political stakes seem bigger than the faith. NRIs and local leaders urged Mr Badal not to interfere in the working of Akal Takht and use its Jathedar for promoting his faction and bringing bad name to the highest temporal seat of Sikhs. In Jan, 2007, in the Delhi Sikh Gurdwara Management Committee (DSGMC) elections, Akali Dal (Sarna) won 27 seats out of a total of 46 seats. The Shiromani Akali Dal (Badal), which had the backing of the Bharatiya Janata Party, won 12 seats while six seats went to the Shiromani Akali Dal (Panthak) led by Manjeet Singh. One seat went to an independent candidate. In closing, Dr. Marwah said that Mr. Sarna is a leader of high caliber with the disciplined mind and communication qualities.